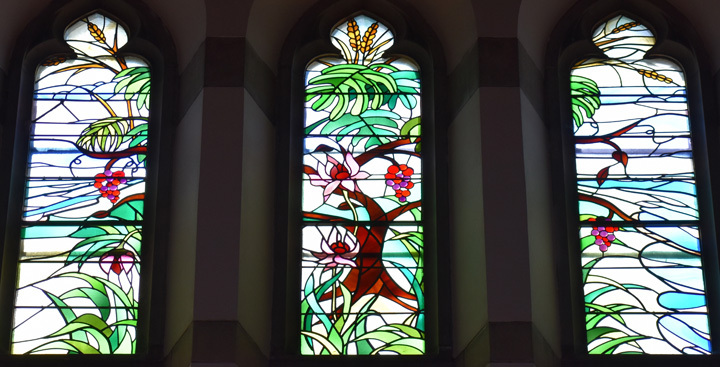 Themes for the windows are chosen from the Old Testament. On the south side, the six days of the Creation are interpreted symbolically, beginning at the back of the nave and progressing from darkness to light as the days lead our eyes toward the high altar. Gen 1:9-13 Then God said, "Let the waters under the heavens be gathered together into one place, and let the dry land appear"; and it was so. And God called the dry land Earth, and the gathering together of the waters He called Seas. And God saw that it was good. Then God said, "Let the earth bring forth grass, the herb that yields seed, and the fruit tree that yields fruit according to its kind, whose seed is in itself, on the earth"; and it was so. And the earth brought forth grass, the herb that yields seed according to its kind, and the tree that yields fruit, whose seed is in itself according to its kind. And God saw that it was good. So the evening and the morning were the third day. Donna Swanson Taylor, formerly of Detroit won our national competition held in 1975 for the design of the 36 clerestory windows. She will assist in their construction at the J. & R. Lamb Studios in New Jersey, the company selected to execute and install the windows. Taylor is an accomplished musician as well as a professional artist and teacher.